When I lived in London I was a frequent visitor to Côte Brasserie on the River Thames, I spent many Summer nights sitting out on their beautiful terrace eating wonderful French food and enjoying the views of London Bridge. 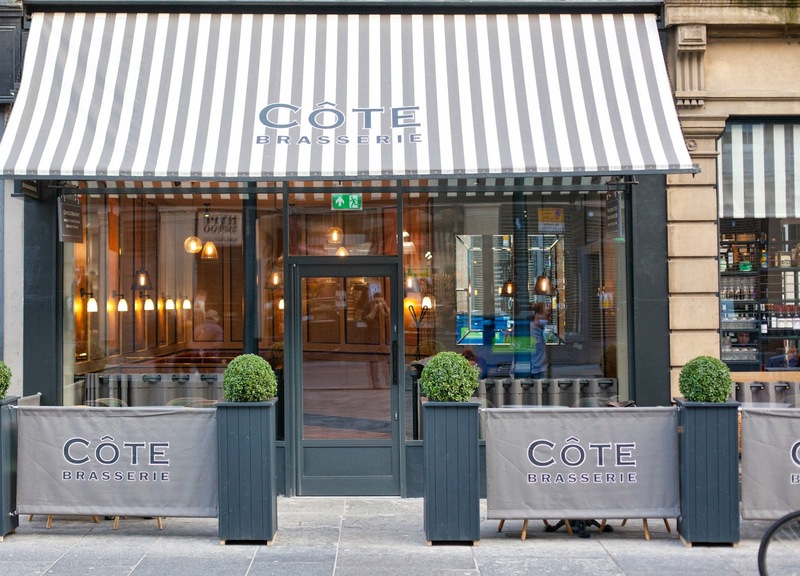 When I relocated to Newcastle it was definitely somewhere that I missed so when I heard that Côte Brasserie was opening in the Toon I was thrilled. Taking up residence in the former Barclays Bank building, the Parisian style brasserie boasts floor to ceiling windows and an outdoor terrace for foodie fans to enjoy romantic nights under the stars. I think you'll agree with me that it's quite the addition to Newcastle's collection of restaurants. The new restaurant opened last week and I was one of the first through the door to experience a taste of France in the North East. With promises of steak, moules frites and an extensive French wine list my mouth was watering in anticipation. 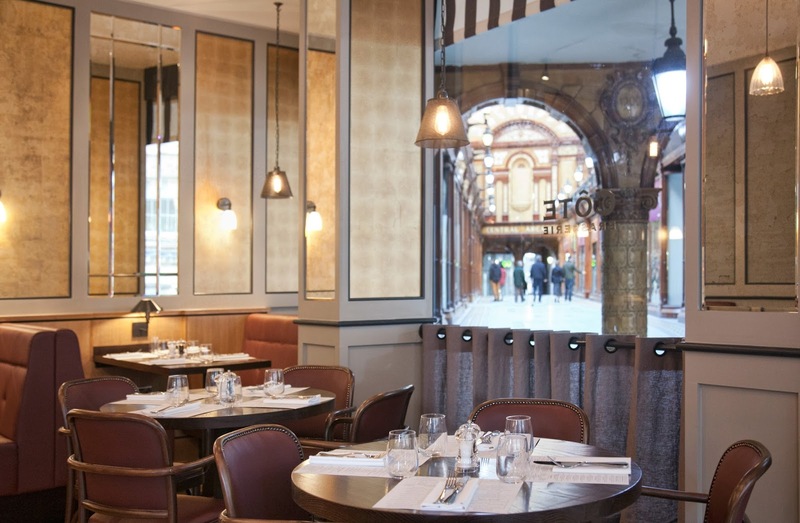 Côte Brasserie offers loads of choice to Newcastle's foodies with a week day lunch and early evening set menu (£11.50 for two courses or £13.50 for three courses), lazy weekend breakfasts (which look amazing!) and the ultimate romantic spot for date night. Our evening started with a few tasters from the Starters menu to share. I will admit I was slightly upset that I couldn't try the French Onion soup that I'd been eyeing up on the menu (next time!) but I soon forgot all about it when our table was filled with the most delicious looking treats! 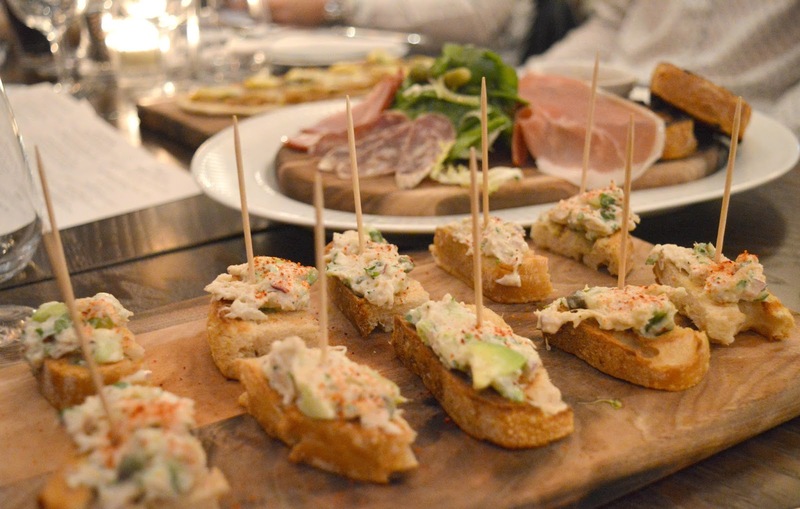 Crab Mayonnaise (£8.50) - crab mayonnaise with avocado, cucumber, capers and tarragon on toasted sourdough bread. So delicious I had to remind myself we were sharing before I cleared the whole board. I will definitely be ordering these again! Calamari (£6.75) - breadcrumbed squid sautéed in garlic, lemon and parsley with tartare sauce. I heard several people on the table comment that this was the best calamari they had ever had and I have to say I agree. So light and crispy! Charcuterie Board (£7.25) - Jambon de Savoie, smoked duck breast, saucisson sec and duck rillettes with baby gem salad and chargrilled pain de campagne. Being a huge fan of a meat board I could have happily eaten this all to myself. It's a "must order" if you're a meat lover. When it came to choosing a main course at Côte Brasserie I struggled to make a decision. I love French food and with so many of my favourite dishes to choose from it was hard work. I was so tempted by Beef Bourguignon (£16.50) and Moules Frites (£12.95) but it was the steaks that really caught my eye. 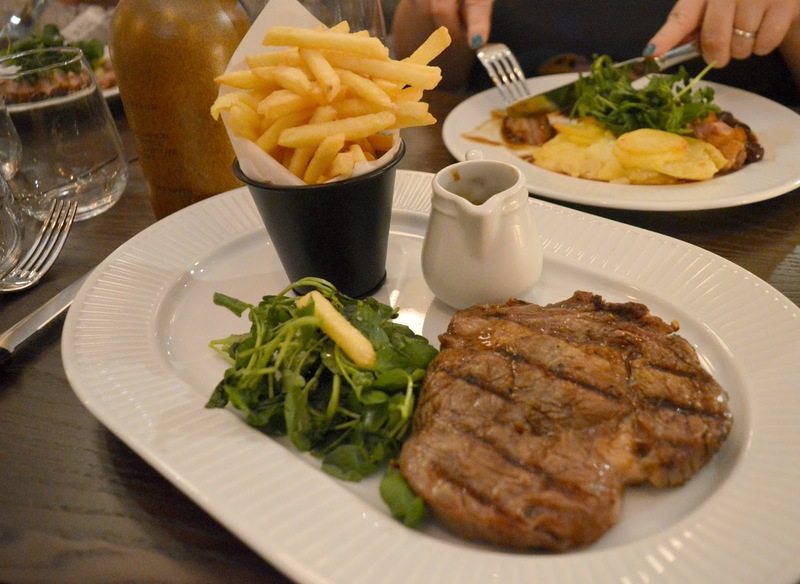 Steaks at Côte Brasserie are from 30 day aged grain fed cattle and served chargrilled with frites. I opted for the 10oz Rib-Eye (£17.50) with Peppercorn Sauce (£2.25). Unfortunately I was a little disappointed in my Main Course and I think this was down to my bad choice so I have no one to blame but myself. The steak was perfectly cooked and the perfect shade of pink but I found the meat to be a little too fatty. I'm not a fan of fatty meat and should have realised that a Rib-Eye wasn't the best choice for me. I spent quite a lot of my meal eyeing up all the other dishes on the table, every one else wiped their plates clean which makes me think the rest of the menu must have been really good. On my next visit I'll be ordering the Roast Duck Breast (£14.95) my neighbour had it and it was making my mouth water! My main course disappointment was soon forgotten when the dessert menu appeared in front of me. 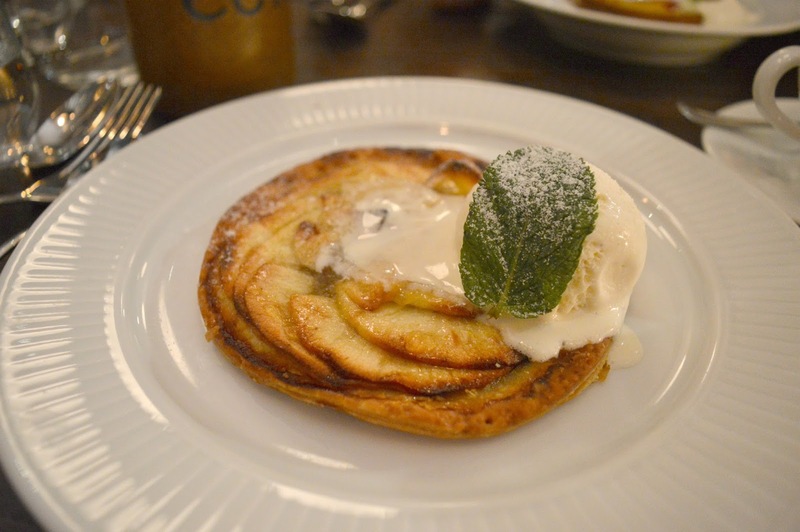 I ordered the Tarte Fine Aux Pommes (£6.25) - Crisp puff pastry with finely layered apples and vanilla ice cream. It was so perfect that I could practically see my face in the dish when I'd finished, I was that determined to clear it! 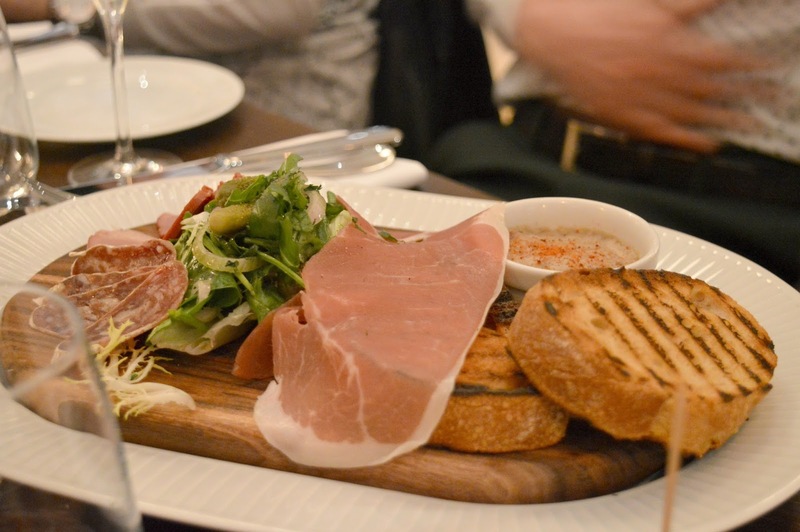 I enjoyed my first visit to Côte Brasserie and I'm eager to try some more of the menu. I can't wait to start planning a date night with Simon very soon! For more food inspiration make sure you follow New Girl in Toon on Instagram and Facebook. I was invited to the press/blogger event at Côte Brasserie - our food and drink was complimentary but all opinions are my own. Great balanced review Chloe! I’m pleased to see another French restaurant in Newcastle. I’ll look forward to trying this out. It's good that your disappointing main didn't ruin your evening there. We have a Cote Brasserie in the town just over from where I live and I keep meaning to go - I clearly need to get my act together with all these restaurants, I have so many near by that you recommend! I have to say, the starters appeal to me most - the Calamari and the Crab Mayonnaise just sound delicious! I've not got as much of a sweet tooth now but the Tarte Fine Aux Pommes looks incredible. I dined off the early evening menu on Friday night and was really happy with my choices of parsnip soup, chicken breast and creme caramel, everything was delicious, I'll definitely be back!